The 10 Best Mountain Biking Trails in Colorado! Colorado is an outdoor playground, and mountain biking is part of the fun during the summer months. 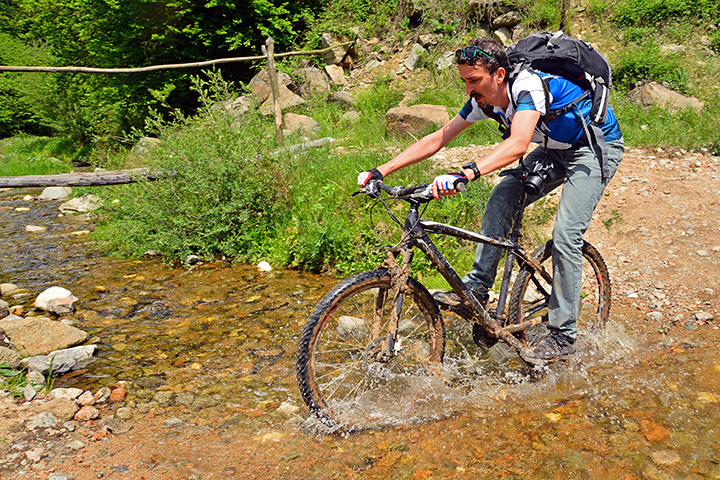 With a number of incredible mountain biking trails in the state, mountain bikers feel right at home here. No matter what skill level you are on a mountain bike, there is a trail in Colorado for you. These 10 best mountain biking trails in Colorado all offer both incredible scenery along with fun terrain. This high-alpine mountain bike trail is one of the best in not only Colorado but the nation. Near Salida, Monarch Crest Trail is about 34 miles of riding that is almost entirely above tree line so you will be rewarded with incredible views of the Collegiate Peaks. Take a shuttle to the trailhead, where the trail leads bikers uphill for about 5 miles and then the rest is downhill for the next 30 miles. This route connects to other popular trails such as Rainbow Trail and Silver Creek. Buffalo Creek Loop is a popular mountain biking trail located near the Front Range of Colorado. Since it’s only an hour outside of Denver, this a great option for Denverites and Denver visitors. However there is a campground near this trail system for those who want to spend a couple days at Buffalo Creek. Expect a few slick rock sections, adrenaline-filled turns and enjoyable downhills. The 18 Road Trail System is a great spot in the Colorado desert by Fruita that has trails for all types of riders, from beginner to advanced. Trails run near cattle pastures and along the area’s Book Cliffs mountains. For intermediate to advanced bikers wanting a challenging yet incredible ride, hit up the Zippity-Doo-Da trail, which is an eight-mile, single track loop that passes over steep ridges and tight edges. For bikers looking for a great trail to bikepack, the Colorado Trail is a top-notch option. Mountain biking the Colorado Trail, however, does take some planning since there are portions of the this 500-mile trail that are off-limits to bikers, specifically the portions in the wilderness areas. A popular spot to bike on this trail is the portion from Silverton to Durango. This single track trail is sure to offer you great views no matter what section you choose to ride on. Crested Butte has a number of mountain biking trails, however Doctor Park is a mountain biking area that shouldn’t be missed. At Doctor Park, near Doctor Gulch, bikers will find gorgeous views along with exhilarating single track downhills. You even will have the option to continue to Spring Creek to gain access to even more trails. There are a number of campsites too for bikers wanting to bikepack the area. Trail 401 is a well-known mountain biking trail in Crested Butte that has become one of the most beautiful and most popular trails in the state. Trail 401 takes hikers up through wildflower fields and aspen groves. At the highest points of the trail, bikers will be rewarded with views of the Elk Range and the Maroon Bells, some of Colorado’s most scenic mountain peaks. Crested Butte is a popular mountain biking destination, but some trails are more crowded than others. For those wanting a more secluded ride, skip the more popular trails to cruise on Teocalli Ridge. The uphill through aspen trees and along a small ridge trail can be grueling, but stick with it to finally reach views of the West Elks Mountains. The downhill is a bit technical at first but then flows into a nice stretch through trees and wildflower meadows. Kokopelli Area Trails is a network of trails, not just one trail, therefore this area is a great place for riders of all skill levels. For more technical sections that advanced riders will enjoy, take your bike to Mary’s Loop to Horsethief Bench Loop. However whatever trail you choose in the Kokopelli trail system will boast incredible views of the area surrounding Fruita. Phil’s World isn’t the most difficult trail on this list but it sure is fun. This single track trail has almost 30 miles of great riding available for mountain biking enthusiasts. Don’t miss out on the area known as “Rib Cage,” which is a section that offers rolling terrain that is sure to get your blood pumping. Northern Colorado has great mountain biking trails too, and Beall Trail is a fun option for those in Steamboat Springs. Beall Trail isn’t exceptionally steep but does take riders up to the top of Emerald Mountain. The views from Emerald Mountain are truly fantastic. Riders can view scenic mountain vistas from the south and west on a clear day.